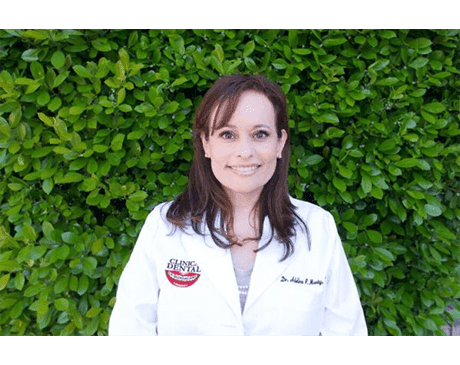 Adelina Pablos Monty, DDS, is licensed in dental surgery and offers a variety of tooth and gum care to the men, women, and children of greater Houston at La Michoacana Dental Clinic. Dr. Monty provides expertise in oral surgery and general dentistry at the Parker Road and Barker Cypress Road offices. As a compassionate dental surgeon, Dr. Monty draws from her diverse foundation of experience, education, and family history in the field. She earned her Doctor of Dental Surgery at Baylor College of Dentistry in Dallas. After receiving her DDS diploma, Dr. Monty decided to never stop learning. In addition to graduating from the prestigious Las Vegas Institute for Advanced Dental Studies, her other continuing education credentials include professional training with Jackson Ortho Plus Seminars, Invisalign®, Pride Institute dental management courses, JP Consultants, and Sterling Practice Management Course. Born in Obregon Sonora, Mexico, and raised in El Paso, Texas, Dr. Monty was destined for a career in oral care. Dentistry is in Dr. Monty’s blood, as she’s a fifth generation dentist: her great-grandfather, maternal grandparents, and parents were all dentists in Mexico. Dr. Monty prides herself on mastering the latest dental technology as well as her commitment to delivering the highest level of dental care available. With countless patients praising her gentle hand and thoroughness, it’s no wonder she’s treated so many of them for over 20 years. La Michoacana Dental Clinic accepts most major insurances. Please call our office if you do not see your insurance listed and see how we can work with you.